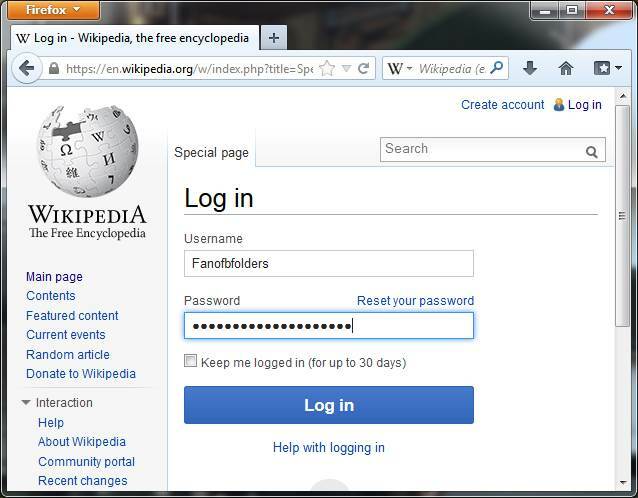 B-Folders allows you to instantly log in to websites by auto-filling the username and the password on the login pages. To use this functionality, you must have the username, password and web address of each website saved as a Login. The Desktop Edition of B-Folders can greatly assist you when signing up for a web site account by generating and auto-filling a strong password in the registration form and capturing the login information in a Login. 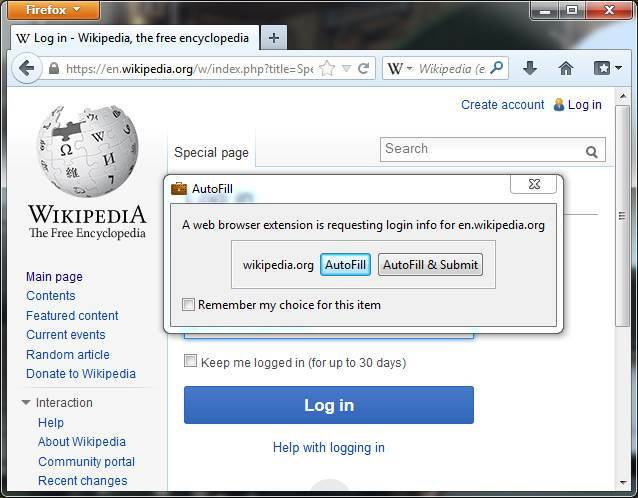 To use any of the password management features in a web browser you must install the B-Folders web browser extension. B-Folders does not allow a direct access to your Logins and other data from any application including web browsers. For this reason, the default setting of the AutoFill action of each Login is to Ask. This way you can choose, if you wish, to provide access to specific Logins without first asking. Even in this case, you will see a notification on the top of the screen that B-Folders web browser extension is requesting login info. When you press the F2 key on a login page for which B-Folders has a Login, an AutoFill window will pop up. By clicking the AutoFill button, the username and password will be auto-filled into the login form. NOTE: Instead of pressing the F2 key, you can select the AutoFill Login command from the B-Folders menu in Chrome and Firefox. The F2 hotkey may not work if the keyboard focus is not on the web page. NOTE: On many web sites B-Folders can even submit the login form (saving you the trouble of clicking the Log in button). However, this feature will not work for all sites and on some sites looping may occur. To try this feature for a specific web site click the AutoFill & Submit button in the AutoFill window. When the B-Folders web browser extension is requesting login info for which the AutoFill window is not displayed, you will see a notification on the top of the screen. When a command from the B-Folders web browser extension cannot be executed because B-Folders is either not running or the database is locked, a notification in the web browser will be displayed. The Retry button will allow you to retry the command after you unlock the B-Folders database. TIP: To open a website for which you have a Login in B-Folders, click on the icon of the Login in the middle pane or click on the Location field (a hyperlink) on the right pane. The web address will be opened in you system's default web browser. Touch the icon of a Login on the Folders screen or the Location field (a hyperlink) on the item details screen. You will be asked to choose an AutoFill option. If you choose AutoFill or AutoFill & Submit, an embedded web browser will open and when it has navigated to the login page, the username and password fields will be filled in automatically. You only need to click the Log in/Sign in button on the web page and you are logged in. TIP: When saving a Login, you don't need to provide the address of the website's login page (which may become invalid). Just use the home page address, e.g. amazon.com, and when you click a Sign in or Login link on the web site, B-Folders will detect the login page and will fill in the fields automatically. AutoFill, Copy username and Copy password commands are available in the options menu on the embedded web browser screen when you touch the three vertical dots or press the Menu key. The options menu also provides the Web address and Close commands to display the web address and to close the browser respectively. To navigate the embedded web browser back to the previous page, press the Back key. Some web sites disable or obstruct navigation to the previous page, so if the Back key does nothing, use the Close command in the options menu. B-Folders embeds the Android web browser based on WebKit. NOTE: Some less common websites display a login dialog box instead of a login page. For these websites, you may need to manually trigger the auto-filling by using the AutoFill command. NOTE: On a small number of sites, auto-filling is not possible at all. To facilitate logging in to such websites, B-Folders provides the Copy username and Copy password commands to easily copy these fields to the clipboard so you can paste into the respective fields on the login page.